Tartan is one of the most distinctive and recognisable textile in the western world and Scotland has become one with it. It is something I am obsessed with, so I’m told ;-), not just working with the fabric but with the history also. The first actual written evidence we see is from the treasurer of James III in 1471 who asks for blue tartan for use by the King. We also have records from James IV court asking for ‘iij elnes of helande tertein’ He paid 8 shillins for it. An elne was 37” in Scotland but 45” in England. In George Buchanans 25 volume of History of Scotland published in 1582, he describes the kilt as consisting of tightly woven cross striped woollen cloth. He also says that; they delight in variegated garments, especially striped and that their favourite colours are blue and purple. Their ancestors wore plaids of many different colours and a number still retain this custom, but the majority, now, in their dress, prefer a dark brown, imitating the leaves of the heather, that when lying upon the heath of the day, they may not be discovered by the appearance of their clothes. We know that in most villages of the day would have had a weaver, in fact there would’ve been a whole cottage industry a lot of the community being involved. There would be the gathering of the wool which came from a now extinct highland sheep. This was a small animal with a short tail, with the males were possibly horned. It would shed its wool naturally and their fibres would’ve been plucked or gathered and spun into a soft fine worsted yarn. Later the cheviot sheep were introduced which had a harder springy fleece, unfortunately with interbreeding of the two the quality became a lot rougher and is now mainly used for carpets. The tartan we see today actually comes from the yarn spun from sheep in New Zealand, then sent to Scotland and spun into the tartan we see today. 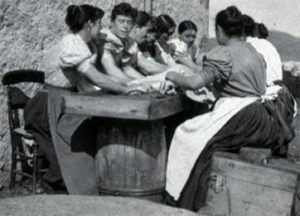 Once the wool had been gathered, someone would be responsible for carding it, preparing the fibres. Then another person would spin it and then off to the dyers. It would be woven into a check, tweed or tartan. Once woven it would be time to waulk the cloth. This was usually scheduled for a specific day of the month as it was a community event sometimes lasting the full day with a lot of the village involved. You would be told on a certain day to leave your urine bucket at the front door to be collected for the process, it had to be stale. The ammonia from the urine would help make the dyes fast, soften the cloth and remove residue oils that was used to dress the wool, it is also said that it made the cloth showerproof but that could be the whole process of shrinking the cloth to a tighter weave. Then once the cloth had been soaked in the urine it would be laid out on a long table, the villagers would sit around the table squeeze and bang the cloth on the table to shrink and soften it. There are a lot of waulking songs that the villagers would sing whilst working, it would give the process some rhythm while working. This would have been quite the social occasion for the village as everyone would be gathered to take part and it being Scotland a lot of drink involved. At this point there is no evidence that there was a massive range of clan or family tartans. The village weaver would’ve woven up patterns, and, like any artist from any era they would have been proud of their creations. It is said that they kept the threadcounts on a stick so they could recreate the patterns. None of these sticks have ever been found. There may well have been some clan chiefs or wealthy families that might have had their own personal tartan woven. There is some evidence that in 1743 Cameron of Lochiel placed a large order of tartan cloth with a company of Glasgow weavers to kit out his clans men. This, I feel, wouldn’t have been the norm and the general population would’ve have been wearing whatever they could get. You could maybe tell someone from another district by the colours of their garment as dyers of each village would’ve been using local plants and insects to create the colours. The 18th century saw the tartan revolution begin. 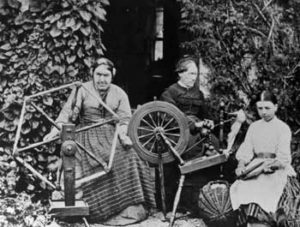 Industrialisation had come to Scotland and the very first industry to set up was in textiles. 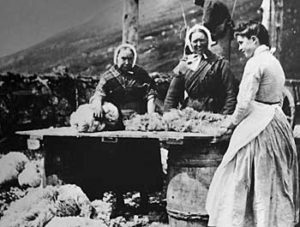 The manufacture of tartans moved into large mill towns and like any cottage industry, even today, it, along with better roads and transportation into the Highlands crushed the village weaver. Because of this a lot of the old patterns may have disappeared. Following the Jacobite defeat at Culloden 1746, the last pitched battle ever fought on the British Isles, Bonnie Prince Charlie fled the field to South Uist and then on to France. Leaving his supporters to suffer the wrath of the Butcher of Cumberland. Then to further punish Scotland further, Parliament issued the acts of proscription, this was not only to disarm the Highlanders but also to rob them of everything that made them who they were, including their dress, which included anything tartan. The plan was to destroy the clans, identities and economic structure of the Highlands. 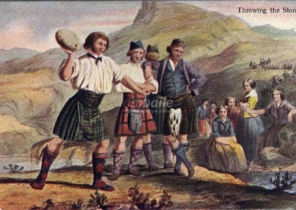 The Highlanders were made to take an oath to “never use any tartan, plaid or any part of highland garb, and if I do so, may I be cursed in my undertaking, family and property – may I never see my wife and children, father, mother and relations – may I be killed in battle as a coward ad without a Christian burial in a strange land far from the graves of my forefathers and kindred” Nice huh! This could be one of the reasons we haven’t found a threadcount stick of any village weaver as the consequences of breaking the proscription were horrendous. First offence could be a fine, if you got a nice Sherriff, another could mean shipped off to the colonies for 7 years, presumably as an indentured slave, and finally execution. I personally wouldn’t have risked it. Peter Macdonald, an authority on all things tartan, says that it is more likely that visitors to weaving cottages probably saw the wooden sticks wound with the warp yarn ready to be strung up on the loom and this could have been what they had described. Which would make sense. The proscription didn’t mean the end of tartan. Highland regiments were exempt; the kilt was worn as part of the uniform. 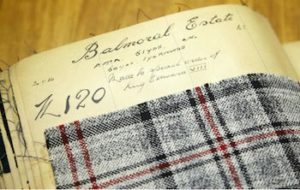 Wilsons of Bannockburn were licensed to weave the tartan for the MOD in 1782. Before this most of the Scottish regiments wore a form of the Black watch or any that matched the colours, it was possibly when Wilsons got the contract that the tartan was standardized and they all conformed to wear the Black Watch or 42nd Tartan. 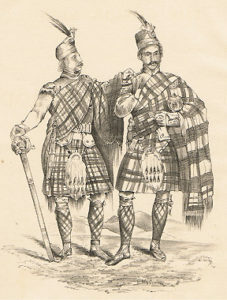 The reason the Black watch tartan was the preferred tartan was because the majority of officers in the regiments were Campbells and the Campbell tartan is Black Watch. When Mackenzie raised his regiment in 1778 he decided he didn’t want the Black Watch so added a red and white line over the top. 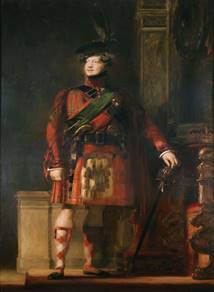 The Duke of Gordon raised his regiment in 1793 and his wife didn’t want them wearing the ‘government’ tartan either so asked a cloth merchant, Mr William Forsyth, to design a new one for them, he obviously put a lot of thought into it, as he stuck a yellow line on top of the Black Watch. I wonder if they noticed that’s all he did. In 1793 the wife of Donald Cameron supposedly designed the Cameron of Erracht tartan for the 79th regiment (later the Queens own Cameron Highlanders) they had been raised by her son General Sir Allan Cameron. 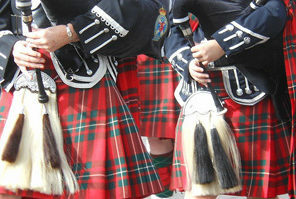 The tartan was said to be based on the Cameron and Macdonald of Keppoch tartans combined. Macdonald was her own family name. We also see from surviving documents that some of the mills in Scotland at the time were sending huge amounts of tartan cloth to the colonies during the proscription. After the repeal of the act in 1782 there was no great rush to go back to wearing the kilt or tartan. It had been 36 years and the people were happy plodding along, in fact a whole generation would not have been around in the ‘good auld days’. It wasn’t until 1822 that tartan truly came back with a vengeance. It all started in 1815 when two gentlemen, Stewart of Garth and Robertson of Struan, were writing to one another about trying to preserve the older clan setts of tartans. 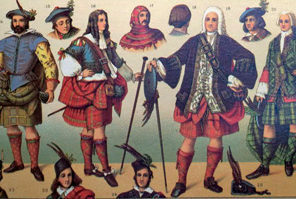 Around the same time the society of London set up its own collection of ‘clan’ tartans. There was definitely a tartan revolution starting and the man who pushed it forward was Sir Walter Scott. With his romantic vision of the Highlands and Highlanders in his books, along with his obsession of bringing history back to life and improving on it. A wee bit extra info, Ebenezer Scroggie, the man whose headstone inspired Charles Dickens ‘Scrooge’, had either catered or supplied the drink for the event. Scott had asked all who were attending the functions to wear full tartan Highland dress. The rush was then on to weave tartans to make up the highland dress for the attendees. As most people hadn’t bothered going back to traditional dress after the repeal and it had now been 40 years, the mills were descended upon in mass by customers wishing to either have ‘their own’ tartan woven or choose some of the tartans already in production. Tartans in the mills were not named at this point just numbered. So, most went into the mill and picked out what they liked and from that point on it was their very own clan tartan. Wilsons of Bannockburn, the main tartan weaving mill of the time, had to build new weaving sheds to keep up with demand, even taking staff from other areas of the business to fulfil the orders then for the next 10 years after the event the mill solely wove tartan. Tartan was now well and truly part of Scotland and its ‘history’. To help it further. There were a couple of brothers around at this time called Charles and John Hay Allan who decided to try and cash in on this. They quietly put a rumour out that they were the grandsons of Charles Edward Stuart, they concocted a story that they had been whisked away at birth and brought up by an English admiral. They were intelligent, charming and good-looking fellows who with their stories, fancies, the sentiments of Jacobite loyalty and of course the romantic literature of the day had the nobility of Scotland eating out of their hands. So much so, they were given free range of Highland estates and lodges to be at their disposal. For a couple of decades, the brothers played off these rumours and lived the high life. Then in 1842 they pop up again only now they’ve changed their names to Charles and John Sobieski Stuart, Sobieski being the name of Charles Edward Stuart mother. This time they have an old manuscript from 1571 that was apparently given to Bonnie Prince Charlie at Douay and was given to their father. It was two volumes of work all about highland dress and contained 49 Highland Tartans and 29 Lowland tartans with coloured plates of the actual tartans and they had it published. Sir Walter Scott and others were asked to verify the manuscript but the Brothers conveniently said their father would not hand it over, so instead they had to look over the published works. The first mistake Scott found was that there was absolutely no evidence that tartan had ever been worn in the Scottish Lowlands, that’s 29 tartans out the window and as for the Highland tartans they could only verify that 6 were indeed correct. The wording of some of the text in the works was said to be not to be of the correct century and some of the tartans had certainly come from the mind of John himself. Even with all this doubt around it a lot of people believed or wanted to believe it. In 1847 an article was published in the Quartley Review, a popular English Journal of the time, dismissing the manuscript and the brothers as frauds. John did write a rebuttal but by then damage had been done and they moved to the continent where they lived out the rest of their lives. Just as the Sobieski brothers were sent packing Queen Victoria and Prince Albert purchased the Balmoral Estate in Speyside in 1848 and built themselves a wee castle. 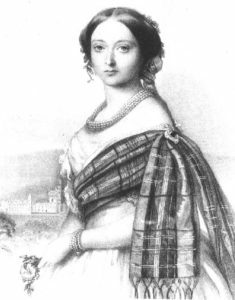 and Victoria loving the Dress Stewart tartan had a red line added to make it her own. In 1851 Queen Victoria turned up at the Great Exhibition, the first international exhibition of manufactured products held in a purpose-built Crystal Palace in Hyde Park, with Albert and her sons all dressed in full highland dress. They say that because of this, sales of tartan amongst the gentry went through the roof. 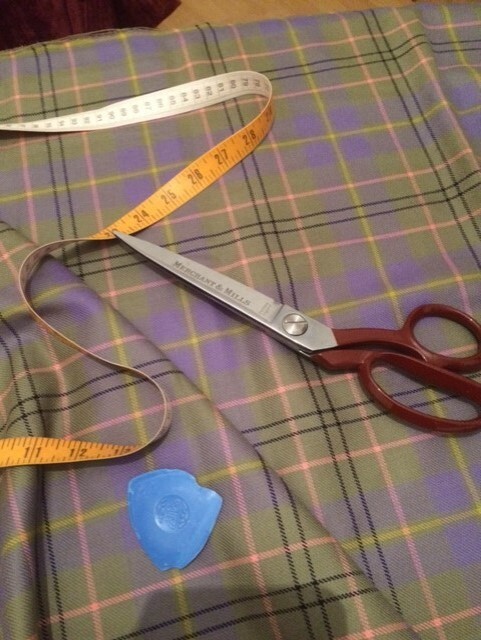 There is an old story that I was told when I started in this industry; that we have to thank Queen Victoria for the introduction of dress tartans. It is said that she thought some of the tartans were rather drab so had white added to the base to make them more feminine. There is another wee story that she supposedly invented the Kiltpin. She was apparently inspecting a Highland regiment on a very windy day. As the kilts were flying up, she took out a hat pin and put it in the kilt to prevent any embarrassment. I have no idea if these are true but they do make nice little stories. Tartan is still as popular today as it was back then, probably more so, and it is still evolving as we speak. We have ancient, modern weathered and muted dyes of each of the tartans. The ancient lighter dyes are said to have come from the Victorian era. They thought that if you were using pure vegetable dyes the colours would be lighter. The Modern darker colours are said to be from using chemical dyes. In fact it has been researched by some dyers recently that the modern colours would have been the older. The weathered dyes were brought out in the 1950s to mimic a piece of cloth that had been dug up from Culloden. Later, another mill brought out their own version of the weathered but with a bit more depth and colour calling it muted. 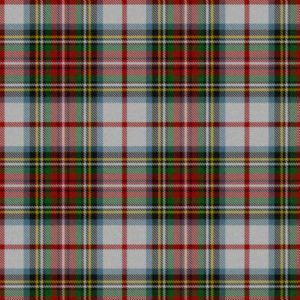 You will also hear the term ‘Hunting colours’, all this is, is a green version of a red tartan. The hunting to be worn during the day and the red one to be worn in the evening. I think it may have been a clever tailor or mill owner that came up with this one. The white dress tartans are now only really worn by Highland dancers. 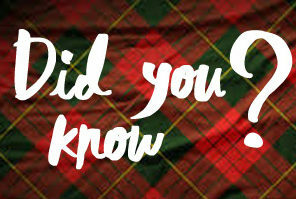 With tartan being so popular it was necessary for an organisation to be set up to preserve the old and new. It started with the Highland Society of London In the 19th century that later set up a sister branch in Edinburgh. The 20th century saw the Scottish Tartans Society and we now have the Scottish Tartans Authority which was set up by leading tartan mills and enthusiasts to gather together the tartans and have a formal database to preserve the history of tartan, just as those before but now also to regulate any new tartans coming out, it is still going strong today. It is an invaluable resource for anyone interested in tartan. We also have The Scottish Register of Tartans which was established by an Act of the Scottish Parliament in 2008 which has taken control of registering any new tartan designs.